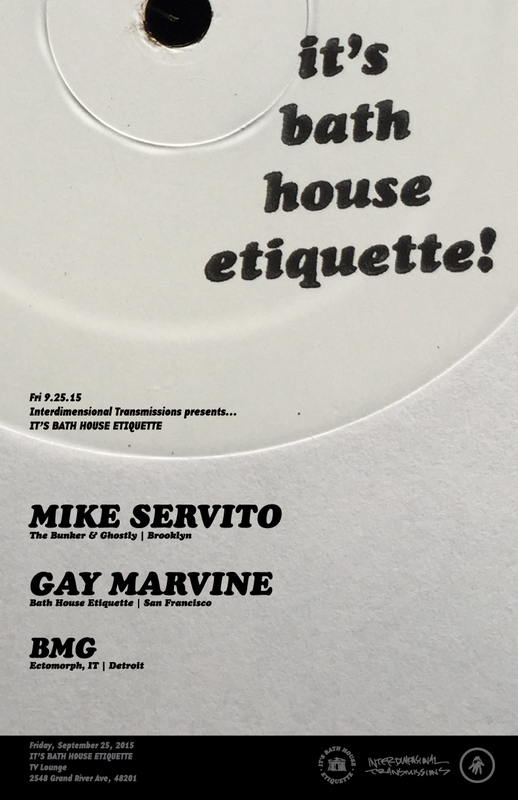 Detroit never forgot about Mike Servito, his upfront dirty deep and bitchy taste has had an impact on Detroit nightlife for over a decade. From debuting in 1995 at Dat's Poorboy parties, to being a resident at blackbx and Ghostly's Untitled (along with Derek Plaslaiko, Tadd Mullinix and Matt Dear), co-founding the bizarrely popular, wild and free Dorkwave, to blowing minds at Interdimensional Transmissions' No Way Back parties, Servito has made his impression. Moving to Brooklyn, Detroit's loss has been their gain, as he has found a proper home with a residency at The Bunker NY, and a plethora of international gigs, including regular spots at Panorama Bar. BMG aka Brendan M Gillen founded Interdimensional Transmissions in late 1994 when he heard far too many ancient voices in his head. Positive that dimensions were colliding and that he could literally feel the deepest will of some mystic past, he decided not to ignore these voices but to contemplate their input, and thus Interdimensional Transmissions came to fruition and the idea-based project Ectomorph found a true home. Since then the vision has continually grown organically and mutated into something that is hard to describe yet easy to feel. His sets effortlessly combine a multitude of seemingly disparate genres into a coalescing solid sound system sensation - pure transcendent psychedelic wizardry. A polymath or sonic alchemist or something. He has recently launched an IT sub-label called Eye Teeth where he has included his first remix with his modular, and has many new productions and collaborations forthcoming on IT, having recently reconvened Ectomorph.